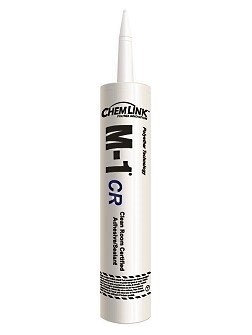 PRODUCT: Chemlink Engineered Systems CLEAN ROOM Grade M-1 Sealant, GRAY Color, 10.1 oz. Tubes. Packed in Clean Room Type Plastic Case. 16 Tubes/Case. Price/Case. NOTES: 1-4 day leadtime. Clean-Room Item, not returnable if case is opened. Also available in White color. 48 cases per pallet (768 tubes). APPLICATIONS: M-1 CR (clean room seal) is a near-zero VOC, moisture curing, polyether adhesive-sealant. Its designed for application in areas where outgassing and/or solvents are not tolerated, including semiconductor wafer fab clean rooms, hard-drive manufacturing rooms, medical device manufacturing, optical product manufacturing, medical research facilities, hospitals, etc. USES: Seals around all types of penetrations including floor penetrations, wall penetrations, a/c ducts, wall panel seams, roof penetration, concrete slab stress relief joints. Also used with Chemlinks ChemSeal floor sealing system (enables pipe penetrations through clean-room floors). PROPERTIES: M-1 CR is solvent free and contains no isocyanates. M-1 CR will not shrink upon curing, will not discolor when exposed to UV light, and can not “out-gas”, or bubble, on damp surfaces. M-1 CRS has resilient “elastomeric” properties and excellent adhesion to most clean room and construction materials. M1 CR develops a high 38-42 Shore-A hardness and excellent resistance to dirt pick-up. M-1 achieves 325 - 375 lbs. per square inch of tensile strength together with 275- 325 % elongation. Its flexibility accommodates dimensional changes in construction materials down to minus 20. VOC Compliant. Very low outgassing: less than 51 ppmw (parts/million weight). Contains no solvents.